Attend the PaaS kickoff webcast on July 5, 2018 Understand how to grow your service business and build solutions based on Oracle PaaS. 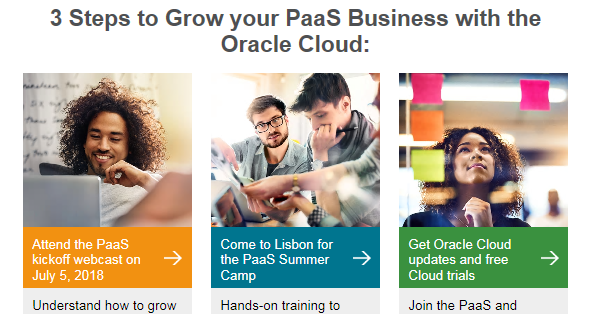 Come to Lisbon for the PaaS Summer Camp Hands-on training to become a certified Oracle PaaS expert. Get Oracle Cloud updates and free Cloud trials Join the PaaS and Developer partner communities for regular Oracle Cloud updates.